When you start a new business, you may well decide the first thing you need is some business cards. You are likely to be tempted by online deals, offering you hundreds of business cards for little or no cost. Suppliers tease you with templates that you can update yourself to make it really easy. But, as with all marketing, even your business card has an objective. In most cases, the objective is to share your contact details in a way that encourages people to get in touch. They will only do that if your card is written and designed to be compelling. And that takes careful thought. QR code to take people directly to a landing page – this is the square equivalent of a bar code that can be scanned using a (Free) QR code Reader app on any smartphone. If you do this, add a call to action telling people how to scan the code and what they will find when they do so. Don’t just take them to your homepage. Be creative. Perhaps take them to a survey or competition instead. Space for people to take notes. This practice is common in the UK, but would be inappropriate in the Far East where business card etiquette is completely different. That’s an awful lot of information to fit into a space that’s on average 88mm x 55mm, so pick and choose the content that is most relevant to you. Remember, both sides of the card offer useful selling space. So if you don’t print on both sides, you are missing a trick. You will see that everything else has to be set up before your business cards can be produced, and all this thinking has to be done in advance. And that’s why, even though your card may not have much copy on it, they can be the hardest words you ever write. 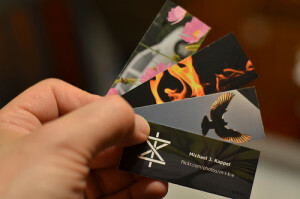 The good news is that business cards are so cheap that you can start with something simple and add to it as your business grows.